Tree, usually 20-40 m tall when mature; branches and branchlets droop strongly; bark ridged and fissured, not tearing off in long thin strips; wood aromatic (potato-like smell); growing "tip" (leader) drooping. Scalelike, opposite, somewhat overlapping, close to stem, with sharp, rigid tip; bluish green. Seed cones like a round, bumpy light green "berry" when immature, brown when ripe, less than 10 mm long, glaucous; pollen cones about 4 mm long. "First described in the genus Cupressus as Cupressus nootkatensis in 1824, [yellow-cedar] was transferred to Chamaecyparis in 1841 on the basis of its foliage being in flattened sprays, as in other Chamaecyparis, but unlike most (though not all) other Cupressus species. However, this placement does not fit with the morphology and phenology of the cones, which are far more like Cupressus, like them maturing in two years, not one. Genetic evidence, published by Gadek et al. (2000), strongly supported its return to Cupressus and exclusion from Chamaecyparis. More recently, Farjon et al. (2002) transferred it to a new genus Xanthocyparis, together with the newly discovered Vietnamese Golden Cypress Xanthocyparis vietnamensis; this species is remarkably similar to Nootka Cypress and the treatment has many arguments in its favour, as while they are not related to Chamaecyparis, neither do they fit fully in Cupressus despite the many similarities. Little et al. (2004), while confirming the above relationship with further evidence, pointed out that an earlier nomenclatural combination in the genus Callitropsis existed, as Callitropsis nootkatensis (D.Don) Oerst., published in 1864 but overlooked or ignored by other subsequent authors. Little et al. therefore synonymised Xanthocyparis with Callitropsis, the correct name for these species under the ICBN when treated in a distinct genus. The name Xanthocyparis has now been proposed for conservation by Miller and Farjon (2006), but until that is decided on at the 2011 International Botanical Congress, it is correctly classified in Callitropsis. Although acceptance of the revised classification of this tree is widespread among botanists, inertia in the horticultural and forestry industries (both typically very slow to adopt the results of botanical research), mean the name Chamaecyparis nootkatensis is likely to continue being listed in many situations." Note Source: Extracted by Adolf Ceska from Wikipedia. Habitat/Range: Wet to mesic slopes and bogs in the lowland, montane and subalpine zones; common in and W of the Coast-Cascade Mountains, rare in SE BC; N to SE AK and S to N CA. For over two decades, the phenomenon of yellow-cedar decline has perplexed researchers. Yellow-cedar (Chamaecyparis nootkatensis) (D. Don) Spach), which ranges from southern Oregon to Prince William Sound, Alaska, was known to be declining on over 200,000 ha of undisturbed forest in southeast Alaska (Snyder et al. 2008). During an aerial survey in 2004, numerous large areas of dead and dying yellow-cedar were found in coastal locations in B.C., and the nature of the dieback was found to be consistent with the phenomenon in southeast Alaska (Hennon et al. 2005). Research into the decline of this long-lived species began in the early 1980s and a sequence of symptoms was identified. The initial symptom was determined to be fine root death, followed by death of small-diameter roots (Hennon et al. 2006) (PDF). As the roots start to die, the trees develop thin off-colour crowns, and necrotic lesions spread from larger roots up the bole (Hennon et al. 2006). The natural resistance of yellow cedar heartwood to decay allows dead trees to remain standing for 80 to 100 years after death. By examining the standing snags it was possible to establish that the decline of yellow-cedars began in about 1880-1900 (Hennon & Shaw, 1997). Investigations initially focused on finding a biotic cause of the decline, but one by one the suspected agents were ruled out (Hennon et al. 1990). Attention then shifted to abiotic factors potentially associated with the decline, and an association with wet, poorly drained soils was found. However, the relation with soil drainage was inconsistent, with limited decline occurring on wet sites at higher elevations (Hennon et al. 2006). Air and soil temperature were determined to be stronger risk factors than poorly drained soils (D'Amore & Hennon, 2006). These clues led researchers to propose a new, complex hypothesis to explain yellow-cedar decline. According to Hennon et al. (2006), saturated soils create open, exposed canopies that experience soil warming early in the spring. This warming triggers the yellow-cedars to lose their cold tolerance, making them more susceptible to freezing injury. Snow appears to protect yellow-cedar against this freezing injury by preventing soil warming. However, the end of the Little Ice Age, which coincided with the onset of decline, has led to a reduction in snowpack at lower elevations (Hennon et al. 2006). This shift in climate may represent the environmental trigger responsible for the decline and suggests that the dieback may expand if warming trends continue (Hennon et al. 2006). BC Ministry of Forests and Range. 2010. Yellow-cedar. In: The Tree Book: Learning to Recognize the Trees of British Columbia. BC Ministry of Forests and and Range, Victoria. Available online. Gadek, P. A., Alpers, D. L., Heslewood, M. M., & Quinn, C. J. 2000. Relationships within Cupressaceae sensu lato: a combined morphological and molecular approach. American Journal of Botany 87: 1044–1057. Farjon, A., Hiep, N. T., Harder, D. K., Loc, P. K., & Averyanov, L. 2002. A new genus and species in the Cupressaceae (Coniferales) from northern Vietnam, Xanthocyparis vietnamensis. Novon 12: 179–189. Little, D. P., Schwarzbach, A. E., Adams, R. P. & Hsieh, Chang-Fu. 2004. The circumscription and phylogenetic relationships of Callitropsis and the newly described genus Xanthocyparis (Cupressaceae). American Journal of Botany 91 (11): 1872–1881. 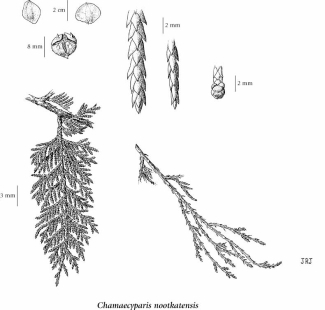 Michener, David C. Chamaecyparis nootkatensis. Flora North America Online. Available online. Mill, R. R. and Farjon, A. (2006). Proposal to conserve the name Xanthocyparis against Callitropsis Oerst. (Cupressaceeae). Taxon 55(1): 229-231.